Ganesha or Ganapati is the leader of the Sivaganas (the forces of Siva). He is the first among the gods to receive all the honors . He is called Vighnaraja, or Vighnesvara, lord of the obstacles and impediments. Devout Hindus worship him for removal of obstacles. Before starting any particular venture or worshipping other gods, they remember Ganesha, their beloved god. The only exception to this rule is when Siva is worshipped. Siva is the father of Ganesha. When you worship the father there is no need to worship the son separately because the son is always found in the heart of his father. So when Siva is worshipped Ganesha is kept in the sidelines. Of all the gods, Ganesha attracts and arrests our attention. No one can fail to notice his peculiar features and his unusual placement in the Hindu pantheon. Looking at his form, a foreigner, who is not familiar with the tenets of Hinduism, would perhaps draw wrong conclusions about Ganesha and about Hinduism. But he would be surprised to know that despite of his looks, Ganesha is one of the most popular gods of Hinduism. Irrespective of their age, gender, education and background, millions are drawn to him irresistibly and worship him deeply with unparallel devotion. His very presence adds a lot of variety and vibrancy to Hinduism. His childlike innocence and behavior, attract the younger lot and draw them into religious life from an early age. They develop friendship with Ganesha and that friendship stays with them for the reminder of their lives. Ganesha has a peculiar, if not grotesque form. His form defies all norms of physical beauty and sense of proportion. But it does not invoke any sense of ugliness or repulsion in those who are devoted to him. Filled with love in their hearts, they see in him a peculiar charm, that is uniquely his own and powerfully appealing. He is short in stature, almost dwarfish to look at and red in color. Circumstances made him live with an elephant head, which sits rather confidently on a big pot belly supported by the stout limbs and legs of a sumo warrior. The color of his body is usually red. But his images in blue, black, green, yellow, white or pink colors are available. He lost one of his tusks in an encounter with Parasurama. So he is left with only one which we see in all his images. The other tusk sometimes appears in his hand and serves as his pen. He is shown with four arms, seated or standing. Sometimes we see more than four hands. His each arm holds a different object. A snake girdles around his pot belly and a yajnopavitam (a sacred thread) dangles across his shoulders. Sometimes the sacred thread is substituted with a snake. He also wears a golden or a silver crown. Rarely we see him with long and flowing hair. A large sivanama adorns his forehead, with a third eye in the middle. His trunk may turned to the left or to the right, depending upon your luck and the intentions of the artist or the sculptor who makes the image. A small funny looking mouse serves him as his vehicle. Looking at the mouse one wonders whether it is his vehicle or his pet, for the mouse hardly seem to have been put to work. One can see it happily sitting at the feet of its master and nibbling away at the tasty food served to its master. In the images he is depicted in several ways. The only way we can tell which aspect he is, is by looking at the objects he holds, his posture and also the color of his body. Depending upon his mood and purpose, he carries several objects. An axe, a broken tusk, modakas (traditional rice cakes), a lute, a sugarcane stem, weapons, a book, a rosary, are some of the popular objects in the list. These objects denote the state of his consciousness. For example if he is shown holding modakas we have to assume that he is in a pleasant and enjoying mood. If he carry weapons we have to believe that he is on some fighting mission. If he is shown holding sugarcane we have to assume that he is in the company of the rural folk. In his most popular aspect he generally holds a noose (pasa) and a goad (ankush) in two arms while the other two are held in the abhaya and varada mudras. Sometimes he appears in the company of Lakshmi and Saraswathi and also his Shaktis namely Riddhi and Siddhi. When he does that people call him Siddhivinayaka. The mystery behind his form: Despite of his looks and abnormal form, Ganesha has millions of followers and devotees all over the world. This amply illustrates the point that true devotion to God independent of our mental notions of form and beauty and that men are capable of worshipping God in all his manifestations, irrespective of what he appears to be. Ganesha has a peculiar beauty and charm of his own. His is not a surface beauty. Hidden behind his peculiar features is a far deeper harmony which a casual glance fails to notice. As you become his true devotee and open your heart to his love, you realize his truly radiant personality. When he touches your heart, you see in Him the beauty of true innocence, purity, divinity and a childlike consciousness that touches your heart with all its captivating charm and ever flowing tenderness. No other god brings out the child in you with all the associated feelings as Ganesha does. No other god, with the sole exception of perhaps his parents, invokes in you the combined feelings of awe and fear. Those who have true devotion to him are able to experience these emotions and understand his true significance. He is known by many names. The most popular ones include: Ganapathi (Lord of the ganas), Vighneswara (lord of the obstacles), Lambodara (potbellied), Vakrathunda (with a curved trunk), Mahaganapathi (great Ganapathi), Parvathinandana (son of Parvathi), Mushikavahana (rider of a mouse), Ekadantaya (one with one tusk), Kumaraguru (child guru), Siddhivinayaka (boon giver), and Balaganapathi (child Ganapathi). There are many other names and forms. There is no temple in India, old or new, without an image of Ganesha in the temple precincts. There is a lot of speculation about his origin and how he became so popular. Some scholars draw a parallel between Ganapathi and Ganapathi Brahmanaspati of the Vedas. Some believe that probably he had something in common with the Maruts or the storm gods of the Vedic pantheon. But we do not find any direct reference to the worship of an elephant god by the name Ganapathi in the Vedas. He was most probably a non Aryan and non Vedic god and had some connection with the earlier cults of Mother Goddess and pastoral worship. He might be even associated with Saivism from the earliest times and became popular with the ascendance of Saivism. With his elevation to the rank of the leader of the gods, he also probably diminished the importance of Indra. Probably these changes were reflective of the metamorphosis that was going on in the Vedic religion, following the collapse of Vedic kingdoms and the migration of the Brahmin families to new lands. His association with the epic Mahabharata must have also made him popular among the masses. Many legends are associated with his origin. These are briefly mentioned here. He was created or manifested by Parvathi. He was the mind born child of Parvathi and Ganga. He was created by Parvathi unknown to Shiva and was beheaded by him due to a misunderstanding. At the behest of Parvathi, he fixed an elephant head upon his headless body and brought him to life. He sprang directly from Siva's face, with great brilliance and captivating beauty, annoyed Parvathi in the process who cursed him to become ugly and dwarfish. He was Krishna with an elephant head. Of these the third version is most popular and widely accepted. Some tend to trace the tradition of Ganapathi to the fear of elephants and rats in ancient farming communities. How he became the leader of the gods? There is also an interesting story about how he became the leader of the gods. Once his father decided to appoint one of his sons as the head of the gods. He called his two sons and arranged a competition between the two. He told them that whoever managed to circle around the universe completely and returned to him first would be given the exalted position. Knowing well his strength and power and sure of himself and his victory, Kumaraswamy sped on his peacock to complete the journey, while the young Vinayaka, knowing his limitations, stayed back. But wisely he considered his father as an embodiment of the entire universe and circled around him. So strong was his faith and belief that wherever Kumaraswami went he found his brother going ahead of him. Tired and bewildered, he returned to Kailash and admitted his defeat. Impressed by his devotion and intelligence, Siva declared Ganesha the winner among the two and made him the leader of gods. Ganapathi is worshipped in various forms. Of late it has become a fashion to keep the images of Vinayaka in drawing rooms and offices, as decorative pieces without offering true worship. This is not at all in line with our traditions. In olden days there was a strict instruction not to keep the images of Vinayaka in ones house unless one was willing to offer him daily worship. Disrespect to Ganesha may not disturb him, but will disturb our spiritual progress, because he is the first god to manifest in our deeper states of meditation. The images of Ganesha are made in different sizes and with different materials. Generally clay, flour, sandal paste, metals, stone and wood are used. Clay, flour and sandal paste are used to make images that are worshipped temporarily and then immersed in water. Any one can make these images and there are no restrictions except that the makers of these images should be pure and clean. The images of Ganesha are rarely kept in the houses after worship. They are generally immersed in the water. There are two main reasons for this peculiar practice. One is the belief that if you keep an elephant in the house, it would devour everything and leave you destitute. And the second reason is that this way Ganesh reminds us all of the transience of life and relationships in this world. Ganesh-chaturthi, is one of the most popular festivals of Hinduism. It is celebrated throughout India for nine days. During this period, people set up temporary pandals in public places and worship Ganapathi. In some places the images are made to stand as tall as one or two stories high. At the end of nine days the idols of Ganesh are carried in a big procession and immersed in a near by lake, river, well or sea. By all means Ganesh-chaturthi is a popular festival celebrated by big and small alike. Ganapathi is worshipped in various aspects. There are a number of temples built all over India for him, where appears in his different aspects. His form depends upon who built the temple and for what end. Some of his most popular forms and their respective names are listed below. Tarunaganapathi: Ganapathi as a youth. Herambhaganapathi: Genesha with five heads and ten hands and a third eye. Saktiganapathi: Ganapathi in the company of his Shaktis, either Lakshmi and Sarasvathi or his wives Siddhi and Riddhi. Achintyaganapathi: Ganapathi in a dreadful aspect worshipped by the secret cults of Tantricism in a negative way. Nrittganapathi: Ganapathi in a dancing mode. Varasiddhi Vinayaka: Ganapathi as the giver of boons. This is the form in which he is normally worshipped on the occasion of Ganesh Chathurthi. Ganapathi has a great appetite for good food. He likes oily and sweet food, fruits and leaves of various kinds and coconuts. Being an elephant god, he is also fond of plants, leaves and twigs. Hence, during Ganesha Festival (Ganesh Chathurthi or Vinayaka Chavithi) he is worshipped with leaves from 21 different plants. These are their native names: machi, brihati, bilwa, durvayugma, datura, badari, apamarga, tulasi, choota, karavira, vishnukranta, dadimi, devadaru, maruvaka, sindhuvara, jaji, gandaki, sami, asvaththa, arjuna and arka. It may be noted that most of them are either medicinal plants or condiments. Ganesha represents all that is grotesque and unusual in the world around a center of purity and divinity and in that synthesis of odds, he symbolizes the unity between the the usual and the unusual, the normal and the abnormal and the beautiful and the ugly aspects of earthly life. He reminds us of the simple truth that everything in the company of God becomes divine. His form dispels many illusions that we entertain in our minds about forms and appearances and the notion that beauty and intelligence go together, where as in truth we rarely see these two in equal proportions. Lord Ganesha is described as the creator of obstacles. But this is only symbolic. In reality Ganesha is a facilitator who helps us in our good actions by obstructing us in our wrong doings. He becomes an obstacle when we indulge in actions that are not in harmony with our divine nature or detrimental to our spiritual progress. As human beings, we have limited awareness and we may not always take the right decision. 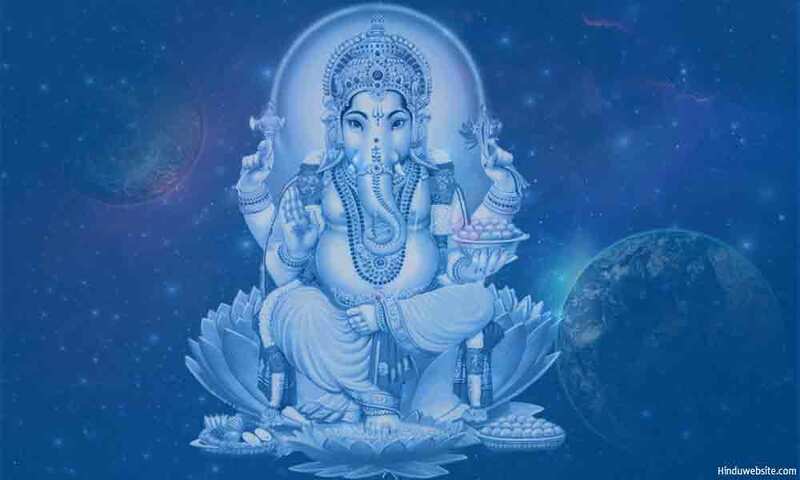 When we surrender to Ganesha and worship Him he helps us in our good actions and prevents us from pursuing wrong aims by creating obstacles on our paths. We are therefore expected to surrender to Ganesha and seek his divine guidance. The food that he devours is not just food. It is symbolic of our insatiable desires, our fears and our devotion. By devouring our desires our love and our fears he develops in us the qualities of detachment and devotion. The mouse which he uses as his vehicle is not a mere mouse but a symbol of our fears and nervousness and our humility and self surrender. To perform any action successfully, we need faith and belief in God. Lord Vinayaka drives away our fears, when he descends into our consciousness and rides our minds. He instills in us the courage to face life and become divine. His large elephant head is indicative of his abnormally high intelligence and his enormous mental powers. Ganesha is an epitome of knowledge, well versed in the Vedas and other scriptures. He put the Mahabharata into writing. His broken tusk gives us the hope that we too can transform our aggressive tendencies and sublimate them into peace and intelligence.